Make your Christmas card experience easy and beautiful with these personalized address labels and envelope seals set from Miles Kimball! Make your Christmas card mailing process as efficient and fast as possible, while still keeping a festive and neat, clean look! This beautiful Christmas Labels and Seals set by Miles Kimball is the perfect addition to your Christmas cards, and the design looks extra gorgeous against red colored envelopes. Swiftly address your cards and stuff the envelopes, and get those cards in the mail to spread some Christmas cheer to your friends, family, and loved ones! With a five star rating on the Miles Kimball website, these Christmas card adornments are the perfect festive additions to your plain and standard envelopes. 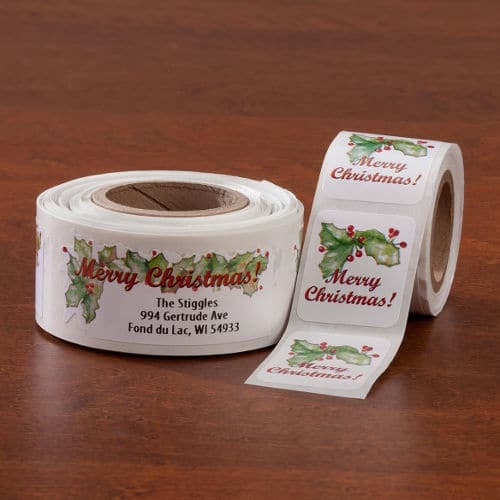 Decorated with red and green holly, both labels and seals feature the message “Merry Christmas” in red cursive, adding a holiday flair. The labels are also die-cut around the holly, making for an extra elegant and special appearance. 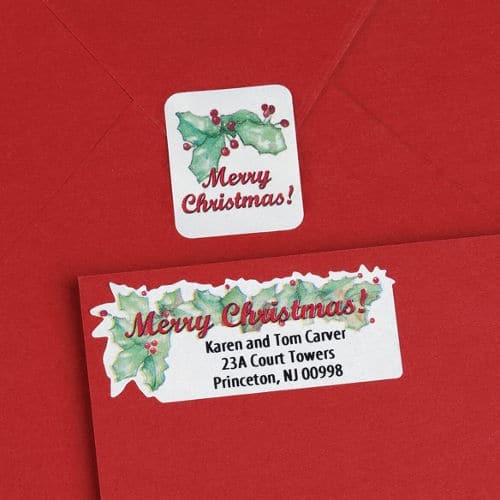 Simply personalize your labels on the Miles Kimball website with your family name and mailing address, and you are ready to spread some Christmas spirit through the tradition of sending holiday cards! Order yours today to have on hand for this Christmas!